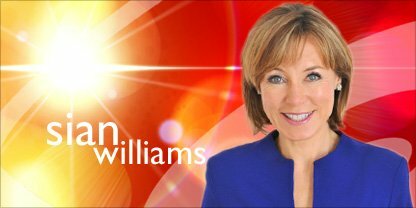 Sian has been a BBC journalist for nearly 25 years and has presented Breakfast for almost a decade - making her the show's longest ever serving presenter. One of her first jobs was in Liverpool, where she spent five years learning to be a reporter and producer, covering stories like the Hillsborough disaster. When she joined Radio 4's World at One and PM programmes, she became the Editor of the Day but also produced special one-off programmes for Radio 4, for example on the day the Beirut hostages were released. She also secured an exclusive interview with Radovan Karadic, the Bosnian Serb war criminal and made programmes from Moscow during the riots as Yeltsin stormed Parliament. While she was on radio, she even worked with Bill Turnbull for a week in 1992, following the then Governor of Arkansas, Bill Clinton, as he launched his campaign to be US President. She was the producer, he was the reporter, and they've been firm friends ever since. She joined TV as one of the Editors of the new rolling news channel, BBC News 24 (now the BBC News channel) in 1997. She was helping with screen tests for presenters for the new network, when one dropped out at short notice. Sian was told to sit in the anchor's seat and did so, wearing a borrowed (man's) jacket, no make-up and blue nail-varnish! A few days later the Head of News offered her the main 4-7pm presenting slot - once she realised he wasn't joking, she took the job - leaving producing behind, for an on-screen career. Two years later, she was moving on again, this time to the 6 o'clock news as its Special Correspondent and occasional presenter. Then, in January 2001, Breakfast asked Sian to join and she was delighted to accept. She spent five years working with Bill as the weekend presenting team, before being asked to sit alongside Dermot Murnaghan in 2004 as the main, weekday presenter. In that year, Sian went to Sri Lanka and Thailand, to report live from the Asian tsunami and later that year, the Pakistan earthquake struck and she spent a week at the centre of the disaster, presenting for all the BBC's news programmes, from Breakfast, through to the Ten O'clock News. Thankfully, there have been happier stories that she's been sent to report on for Breakfast - Ellen MacArthur's return after breaking the round-the-world record, when London was given the 2012 Olympics, the heart-warming recovery of Danny Biddle, who nearly died in the July 7 bombings, returning to hospital to thank staff for saving his life. When Dermot left Breakfast a few years ago, it seemed natural for Bill to join Sian on the sofa. Breakfast has more viewers now, than ever before and they are both very proud to be part of Britain's most watched morning programme. When Sian's not getting up at 3.45am, she's looking after her 4 children - who range from 18 to one!